The 2011 Opus One expresses fresh aromas of bright red fruits, Herbes du Provence, bay leaf and cassis which give way to sublter notes of black tea and white pepper. The wine's round tannins and creamy texture envelop the familiar flavors of fresh cherry, caranberry and boysenberry with a touch of dark chocolate. 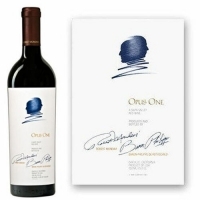 This polished and ageworthy wine simultaneously offers a satiny finish and a slight grip of tannin on the close.